The Virginia Theological Seminary is pleased to announce that three new Fellows of the Center for Anglican Communion Studies have been appointed. Dr. Najah Nadi Ahmad is the Center for Anglican Communion Studies' Fellow in Peace and Reconciliation. The Rev. Prebendary Rose Hudson-Wilkin is the Center for Anglican Communion Studies' Fellow in Public Theology and Dr. Lucinda Allen Mosher is the Center for Anglican Communion Studies' Fellow in World Anglicanism. Fellows act as advisors to the director of the Center for Anglican Communion. Dr. Najah Nadi Amhad is the Center for Anglican Communion Studies' Fellow in Peace and Reconciliation. Dr. Nadi Ahmad has a D.Phil from the University of Oxford, UK and is the Aziz Foundation Lecturer in Islamic Studies at the Cambridge Muslim College, UK. She is a classically trained Muslim scholar with a particular interest in hermeneutics; the history and development of Islamic law and legal theories; fatwas and fatwa institutions; Islamic intellectual history; and ethics. She worked as a contributing editor for the Integrated Encyclopedia of the Qur'an, a research assistant at Egypt's Official Fatwa Council, and has taught in Egypt, the UK, and the USA. She has given a series of lectures and presentations on Shari'a, Muslim Family law, Fatwa, and hermeneutics in a variety of contexts internationally. 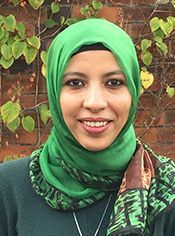 Dr. Nadi Ahmad holds an MA in Religious Studies from Boston University and a BA in Islamic Studies from al-Azhar University in Cairo. The Rev. 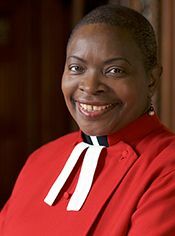 Prebendary Hudson-Wilkin holds a B.Phil in Education from the University of Birmingham, UK and is the 79th Chaplain to the Speaker of the House of Commons in the UK Parliament. A priest ordained in the Church of England she is a chaplain to Her Majesty the Queen; Priest in Charge of St. Mary-at-Hill Church in the City of London near Monument. Formerly Diocesan Officer for Black Anglican Concerns, Rev. Hudson-Wilkin presently has pastoral and liturgical responsibilities for a range of people and plays a key role in state events in the British parliament. She has leadership experience across a range of religious and civic institutions and charities. For five years Rev. Hudson-Wilkin was a member of the Broadcasting Standards Commission in the UK. She is Priest Vicar at Westminster Abbey and Prebendary (a non-residentiary canon) of St. Paul's Cathedral both in London, England. In the Anglican Communion, Rev. Hudson-Wilkin was a chaplain to the Lambeth Conference and member of the Anglican Consultative Council. A powerful and prophetic voice in the UK and Anglican Communion with experience in inter-cultural and inter-religious work she is in high demand as a speaker and broadcaster. Dr. Lucinda Allen Mosher received her Th.D from General Theological Seminary and is a moral theologian with expertise and experience in inter-religious dialogue. She is Assistant Academic Director of the Building Bridges Seminar (an international Christian-Muslim dialog initiated by the Archbishop of Canterbury in 2002) and Faculty Associate in Interfaith Studies at Hartford Seminary (CT). She also has served as Professor of Ecumenical, Interfaith, and Anglican Studies at the Séminaire de Théologie d’Église Épiscopale d'Haïti (STEEH), as a member of the Anglican Communion Network of Inter-Faith Concerns management group, and as an occasional resource person on interfaith matters to the World Council of Churches. As an educator, Dr. Mosher has also worked in the Convocation of American Churches in Europe and for the Church of Uganda. 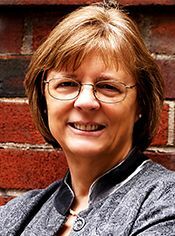 The author and editor of numerous books and articles, her works include Toward Our Mutual Flourishing: The Episcopal Church, Interreligious Relations, and Theologies of Religious Manyness (Peter Lang, 2012) and the three-volume series Faith in the Neighborhood (Seabury Books).